Blessed Saint Vasilii (Basil), Moscow Wonderworker, was born in December 1468 on the portico of the Elokhovsk church in honour of the Vladimir Icon of the MostHoly Mother of God, outside Moscow. His parents were common folk and sent their son for training in the cobbler's (shoemaker's) craft. During the time of teaching his apprentice the master happened to be a witness to a certain remarkable occurrence, wherein he perceived, that his student was no ordinary man. A certain merchant had brought grain to Moscow on a barge and then went to order boots, specifying to make them such and so, since he would not pick them up for a year. 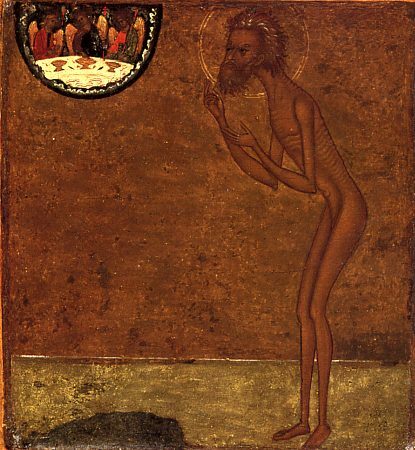 Blessed Vasilii uttered weeping: "I would thee leave them such, since thou will not wear them out". To the perplexed questioning of the master the apprentice explained, that the man making the order would not put on the boots, but rather would soon be dead. After several days the prediction came true. At age 16 the saint arrived in Moscow and began the thorny exploit of foolishness. In the burning Summer hear and in the crisp harsh frost he walked about bare-legged and bare-foot through the streets of Moscow. His actions were strange: here he would upset a stand with kalachi, and there he would spill a jug with kvas. Angry merchants throttled the blessed saint, but he took the beatings with joy and he thanked God for them. But then it was discovered, that the kalachi were poorly cooked, the kvas was badly prepared. The reputation of Blessed Vasilii quickly grew: in him they perceived a fool, a man of God, a denouncer of wrong. A certain merchant was intent to build on Pokrovna in Moscow a stone church, but thrice its arches collapsed. The merchant turned for advice to the blessed saint, and he pointed him toward Kiev: "Find there John the Cripple, he will give thee the advice, how to construct the church". Having journeyed to Kiev, the Merchant sought out John, who sat a poor hut and rocked an empty cradle. "Whom dost thou rock?" – asked the merchant. "My beloved mother I do beweep, long indigent for my birth and upbringing". Only then did the merchant remember his own mother, whom he had thrown out of the house, and it became clear to him, why he was in no wise able to build the church. Having returned to Moscow, he brought his mother home, begged her forgiveness and built the church. Preaching mercy, the blessed saint helped first of all those, who were ashamed to ask for alms, but who all the while more were more in need of help than others. There was an instance, where he gave away a rich imperial present to a foreign merchant, who was left without anything at all and, although for three days already the man had eaten nothing, he was not able to turn for help, since he wore fine clothing. Harshly did the blessed saint condemn those, who gave alms for selfish reasons, not from compassion for the poor and destitute, but hoping for an easy way to attract the blessings of God upon their affairs. One time the blessed saint saw a devil, which took on the guise of a beggar. He sat at the gates of the All-Pure Virgin's church, and to everyone who gave alms, he rendered speedy help in their affairs. The blessed saint exposed the wicked trick and drove away the devil. For the salvation of one's neighbours Blessed Vasilii visited also the taverns, where he endeavoured, even in people very much gone to ruin, to see a grain of goodness, and to strengthen and encourage them by kindness. Many observed, that when the saint passed by an house in which they madly made merry and drank, he with tears clasped the corners of that house. They enquired of the fool what this meant, and he answered: "Angels stand in sorrow at the house and are distressed about the sins of the people, but I with tears entreat them to pray to the Lord for the conversion of sinners". Purified by great deeds and by the prayer of his soul, the blessed saint was vouchsafed also the gift of foreseeing the future. In 1547 he predicted the great conflagration of Moscow; by prayer he extinguished a conflagration at Novgorod; one time he reproached tsar Ivan the Terrible, that during the time of Divine-services he was preoccupied with thoughts about the construction of a palace on the Vorob'ev hills. Blessed Vasilii died on 2 August 1557. Saint Metropolitan of Moscow Makarii with an assemblage of clergy made the funeral of the saint. His body was buried at the Trinity church, in the trench where in 1554 was being annexed the Pokrov cathedral in memory of the conquest of Kazan. The glorification of Blessed Vasilii was by a Sobor-Council on 2 August 1588, which His Holiness Patriarch Job proclaimed. In a description of the appearance of the saint characteristic details were preserved: "All bare, in the hand a staff". The veneration of Blessed Vasilii was always so strong, that the Trinity temple and the attached Pokrov church are to the present named the temple of Blessed Vasilii [i.e. the famous Saint Basil's in Moscow]. The chains of the saint are preserved at the Moscow Spiritual Academy.